Last Thursday, a gathering at a Toronto nightclub got more wild than anticipated when a young lion cub was brought into the mix. Photos surfaced on Instagram of clubgoers taking selfies with the young cub at Lavelle, a lounge that boasts a rooftop restaurant and pool. 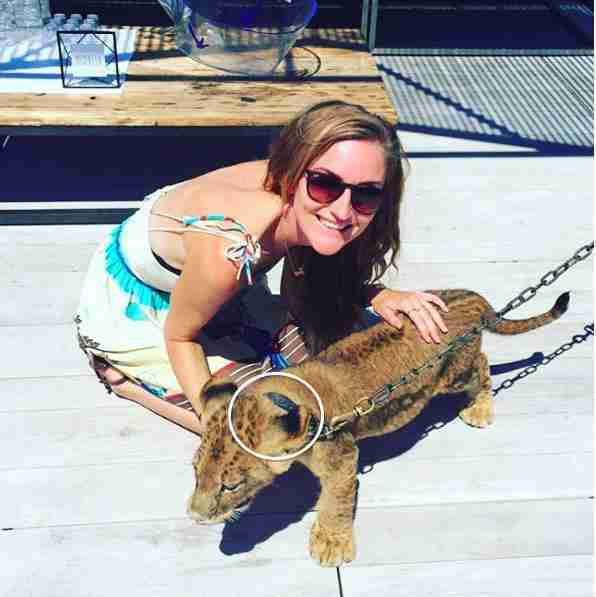 When Animal Justice, a local animal welfare organization, was alerted to the photos last Friday, the group reported the incident to Toronto Animal Services (TAS), citing a Toronto law that forbids the possession of lions and other exotic animals. TAS is currently investigating the incident. "It's illegal in Toronto to parade exotic animals around nightclubs for marketing purposes," Camille Labchuk, a lawyer and executive director of Animal Justice, said in a press release. "Baby animals aren't toys. This lion cub should be with her mother, not used as a prop for selfies." According to Labchuk, she also has unconfirmed reports that the lion cub came from the infamous Bowmanville Zoo in Ontario, Canada. The zoo, which is owned by Hollywood animal trainer Michael Hackenberger, became infamous last year after videos were released showing Hackenberger whipping a tiger during training, and bragging about how he likes to hit his wolves. "The lion cub seen at Lavelle is wearing the same collar as a cub from the Bowmanville Zoo," Labchuk said in a statement to The Dodo. "What's more, the main page of the Bowmanville Zoo, as well as their Facebook page, advertise 'lion cub encounters' with four lion cubs. According to an announcement on the Bowmanville Zoo's Facebook page, four female lion cubs were born in June of this year. 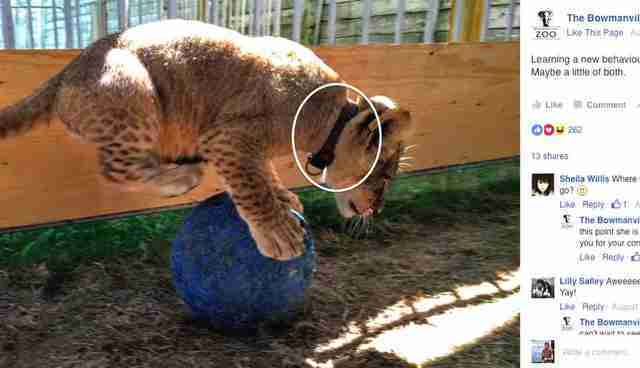 This age is consistent with the lion cub seen at Lavelle," she said. A spokesperson from Lavelle confirmed to City News that a guest did indeed bring a lion cub - but that the arrival of the cub was not authorized or arranged by management. After Lavelle's staff discovered the lion cub's presence, the guest who brought the young animal in was asked to leave. Bowmanville Zoo is also known for renting out its animals for events - like parties with Justin Bieber. In June, the zoo announced it was closing its doors due to low attendance, blaming the video, which was released by PETA, for public displeasure. "People are staying away because they believe PETA's allegations," Bowmanville Zoo said at the time. "The fact is PETA released only a short piece of a long video, and then misrepresented what transpired in that short part. What they said is not true, but it doesn't matter - the damage is done." Some have expressed concerns that Bowmanville's animals would be given to similar roadside zoos, or that the zoo would just reopen under another name. Hackenberger was slapped with five counts of animal cruelty by the Ontario SPCA back in April and, if convicted, faces at least two years of jail time, a $66,000 fine and a potential lifetime ban on owning animals. In order to make animals like lions and tigers tame enough to handle such close contact with humans, they're stolen from their mothers as cubs, beaten and even drugged.